10% off store wide sale! Since Barry is away teaching at Arrowmont, Michael & I are going to have a weekend surprise sale. Barry will be surprised to find out we did this but we don’t care! So shop early and save for Father’s day! Sale ends Sunday evening 12:00 PM DST. Use coupon code WS-18 in the coupon section upon checkout! Please Note: Items in the Bangle Bracelet, Lathe, Alumilite & Stabilization product categories are not included in this discount. 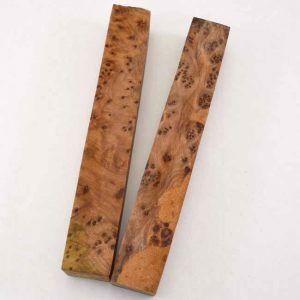 Thuya Burl Back In Stock! Thuya Burl is back in stock! Just arrived from Morocco is this great burl with plenty of eyes! Thuya burl’s color varies from a rich, lustrous golden brown to nearly black. Usually the eyes within the burl are perfectly round and are scattered throughout the burl. When turning Thuya Burl, it emits a sweet fragrance that fills my shop each time it is turned. I want to personally thank the staff of the Midwest Pen Gathering for a great 3 days. The different talented speakers inspired all that attended. I have been making pens for over 25 years and I still am amazed at the creativity and talent so many pen makers have! Looking forward to next year where ever it will be held. 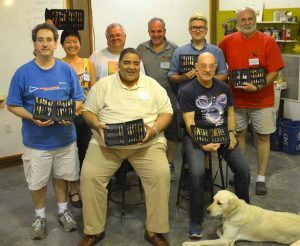 Now, I am gearing up for a week long, sold out pen making class at Arrowmont School of Arts & Crafts the first week of June. Mark Gisi & Dan Symonds will be joining me for a week long intensive class on pen making – looking forward to seeing all those who signed up. 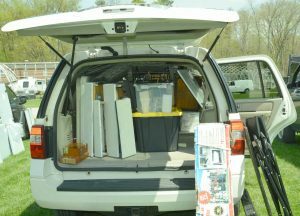 Be Prepared For Craft Shows! The price of craft shows are going up, so in order to get your money’s worth you must think ahead and be prepared. 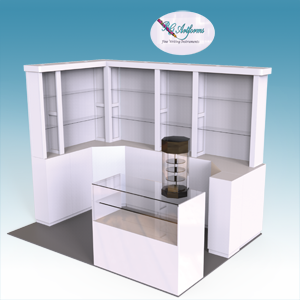 I attended an upscale craft show in the New York City area and paid over $1,300 for the booth and hotel accommodations. As you can see from the picture my car was packed to the roof to everything I thought I could use. You would think after all these years of doing shows, I would be prepared at all times, NOT!!! Like I always do, I checked the weather report and it was supposed to be sunny and in the 80’s all weekend. A weather person’s job is the ONLY job that if they blow a forecast they still get to keep their job! The first day of setup was in the 80’s and hot. The next morning I woke up and it was raining and in the 60’s. Of course I only packed shorts and short sleeve shirts, glad my neighbor took pity on me and loaned me his jacket for the day or I would still be shivering. Lesson learned, pack a variety of clothes to make yourself comfortable so you can focus on your customers and not your frozen body! The show turned out just okay, the weather played a factor in attendance but it could have been much worse if not for my nice neighbor loaning me his jacket! The Homestretch at the Grand Central Holiday Show! Cigar Pen display with 1 cigar pen left! There’s only three days to go, and I am running on empty! Just this week so far, including Thursday (yesterday), we sold over 130 pens, and I am starting to run out of them! Since we are literally IN Grand Central Station, which is known to be one of the busiest places on Earth, the customers come in waves while they try and catch their trains. At one point Thursday afternoon, in the 5:00 hour, 20 pens were sold. That works out to someone buying a pen every 3 minutes! I still have a few high end watch pieces left, but they will not last until Sunday. All my Cigar pens are gone. I started with 85 of them. 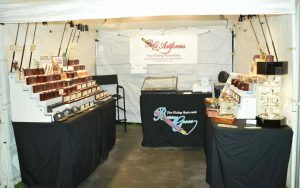 Look at the photo to the left, there is only 1 cigar pen in there, before that got sold later in the day. Only a few of my Abalone and Pheasant Feather pens are left, and I know they will not last till Sunday! Looks like I will be bringing home empty pen cases, which is never a bad thing. After packing everything up, and driving home, I plan on getting some sleep – maybe a lot of sleep. After I get a chance to slow down and look at the whole experience, I’ll post some final thoughts about this marathon craft show. PS – Since this post has been sitting here for a couple of hours, someone just bought 2 of my high-end coin pens. While Barry’s away, his helpers will play! 10% Off all Gift Cards! Barry is in the homestretch of his last week at the Grand Central Holiday Crafts Show in NYC. He’s doing 10 hour days by himself in his little store in Vanderbilt Hall. Everyone else is back in the office fulfilling orders. 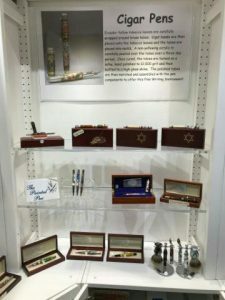 Since Barry has been so busy this holiday season selling his finished pens, we haven’t been able to have any really good sales on pen making kits & supplies. Soooooo… we thought that now would be a good time to put the gift cards on sale at 10% off. This is great for last minute gift giving to your favorite penturner, even if that favorite penturner is YOU! It’s also a good game plan for 2018. Using the gift card allows you to get a 10% discount on anything you need, whenever you want it, during the year. Use it to pay for something that is already on sale, and the savings get even better! More money back in YOUR pocket. The gift cards are available in several denominations. Mix & match several cards to get the amount you need. They don’t expire. 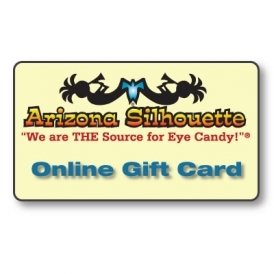 If you are giving the gift card as a gift, we have a printable certificate that you can give. Full explanation of the card is on the website. Click the link below to read all the info about ordering a gift card. Anyway, we’re looking forward to 2018, when everything is back to normal here at Arizona Silhouette! With less than 21 days to go I am in FULL PANIC mode. I’m sure a LOT of you have been there too. The booth is finally completed, and it looks great. I am making 20-25 pens *daily* trying to make sure that I have enough pens to last the 42 days of the show. Yes, a 42 day show! I am planning on bringing over 600 pens to the show, and I have a feeling that may not be enough. That is the reason for the panic! BUT, with that said, I am having a ball and looking forward to doing the show! to serving you for many years to come! We’ve worked on some *really* good deals to celebrate, and save you a LOT of $$ ! Below are our featured specials, with even more deals in our special 5th Anniversary section on our store. Every purchase of $100 or more, excluding shipping, is entered for a chance to win a $125 online gift card. Multiple purchases means multiple entries. The contest starts today, and will run until September 30th. The drawing will take place on Monday, October 2. Winner will be notified by email, and then announced on our blog. Good Luck! Arizona Silhouette Takes A Vacation Day! Yes, We are going to try it again on Wednesday July 25, 2017 – take a day off the last time we tried to take a day off and take the grand kids to the shore it rained. The weather is supposed to be good tomorrow so we will be closed and re-open on Thursday July, 26, 2017. If you need anything, I will help you on Thursday – thanks- Barry and company!